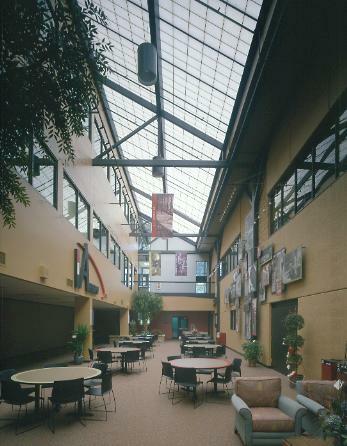 A partnership project that included a covered atrium and connection walkways. The owners of the JF Ahern Building in Fond du Lac, Wisconsin needed more office space to keep up with their growing business. They needed as much space as possible, but they didn't want to tear down their existing office building. And with energy trends steadily climbing, they knew the new site had to be energy efficient in every possible way. The owners and architects came up with a solution. The building owners worked out a way to acquire an adjacent property, creating the land needed to build a bigger space. PTD Architects came up with a design that maximized energy use and connected the old building with the new, 54,000 foot2 office facility. JF Ahern Project Manager Craig Bahr says, "Connecting the new with the old presented challenges. We decided to create an atrium with a 20-foot separation between the two buildings with stairwells and connecting bridges at the ends. We used the Kalwall + LUMIRA® aerogel skylights to create a covered atrium and bridge walkways for a span of 100 feet." With such a long walkway between the two buildings, the interior temperature must be stable in any climate. Kalwall suggested its newest Kalwall + LUMIRA aerogel skylights with an R-value of 20. "It was a good solution," says Bahr. "The insulated skylight provides natural daylighting to the atrium and interior offices overlooking it. The system provides good insulating value with low solar heat gain." Bahr says walking through the Kalwall + LUMIRA aerogel-covered atrium is comfortable in all seasons. This feature is in line with other sustainable design aspects of the property. For example, the building uses collected rainwater to flush toilets, and ice frozen during off-peak energy hours to cool the facility during the day. The JF Ahern Building is applying for LEED® Gold certification.